Acts 12 [1.] Now about that time, King Herod stretched out his hands to oppress some of the assembly. He killed James, the brother of John, with the sword. When he saw that it pleased the Jews, he proceeded to seize Peter also. This was during the days of unleavened bread. When he had arrested him, he put him in prison, and delivered him to four squads of four soldiers each to guard him, intending to bring him out to the people after the Passover. Peter therefore was kept in the prison, but constant prayer was made by the assembly to God for him. The same night when Herod was about to bring him out, Peter was sleeping between two soldiers, bound with two chains. Guards in front of the door kept the prison. Acts 12 [7.] And behold, an angel of the Lord stood by him, and a light shone in the cell. 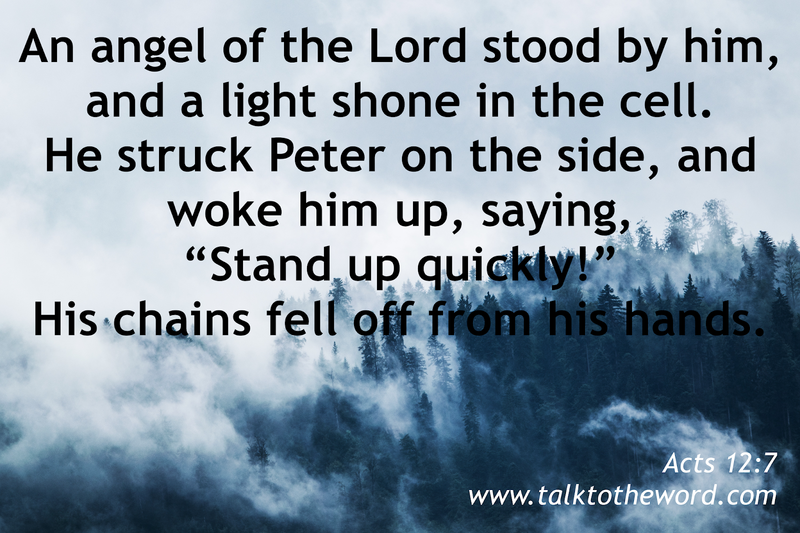 He struck Peter on the side, and woke him up, saying, “Stand up quickly!” His chains fell off from his hands. The angel said to him, “Get dressed and put on your sandals.” He did so. He said to him, “Put on your cloak, and follow me.” And he went out and followed him. He didn’t know that what was being done by the angel was real, but thought he saw a vision. When they were past the first and the second guard, they came to the iron gate that leads into the city, which opened to them by itself. They went out, and went down one street, and immediately the angel departed from him.